It pays off to look around during your commute to work: You never know when a work of public art might transport you to a different universe altogether. 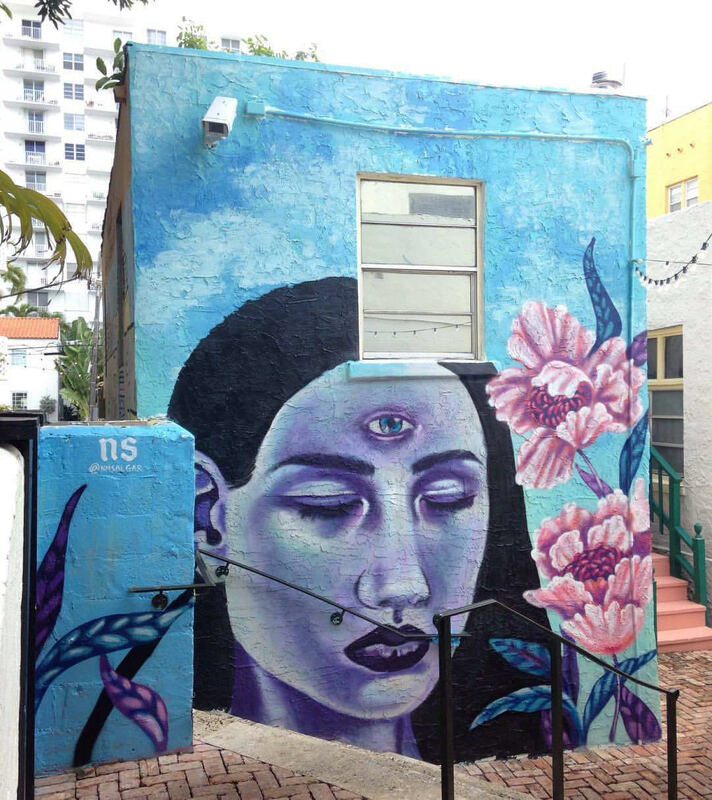 We recently discovered the work of Nicole Salgar and can’t get over the gorgeousness of her murals. 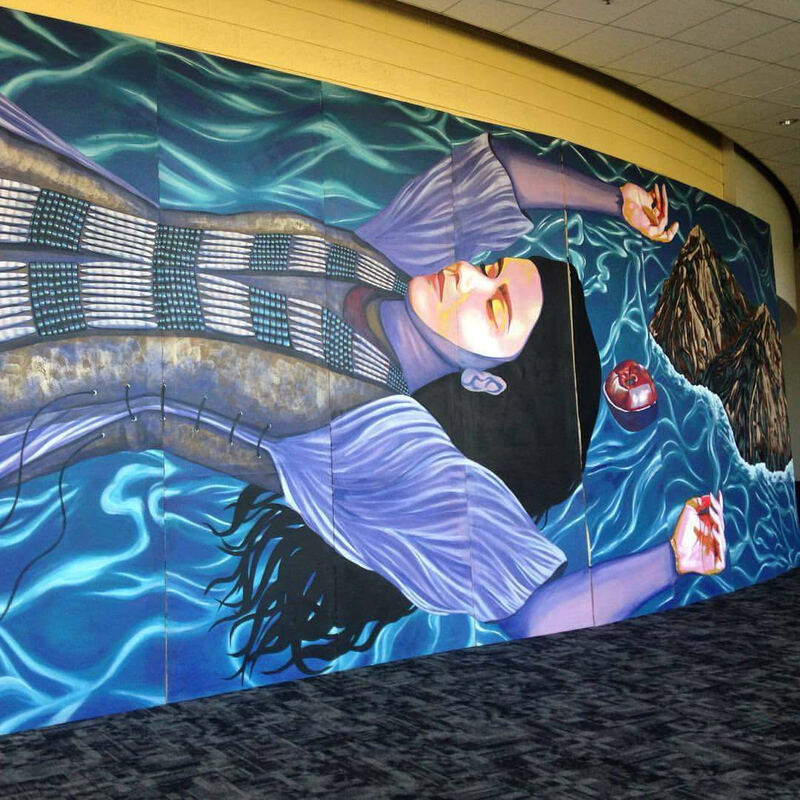 Each piece seems to transform the wall into a portal to a totally different world with mysterious figures. A lot of her work also references themes of spirituality, such as the idea of the third eye. But Salgar didn’t always know she would end up painting walls in public places. 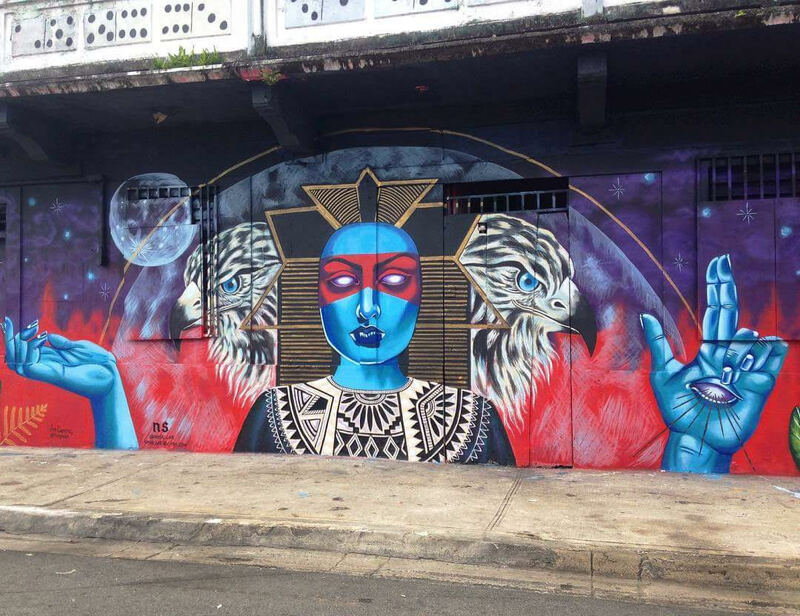 "I have always been drawn to art but painting murals was not my first passion," Salgar tells HelloGiggles. "At a young age I studied art in magnet schools and at 15 I chose to study fashion design at Design & Architecture Senior High in Miami." She later attended the Fashion Institute of Technology and freelanced in the fashion industry for a few years. But things changed once she realized an office job wasn’t her ideal career path. She started exploring art again and now paints both on canvas and in the streets. Public places give her more of an opportunity to not only explore aesthetic possibilities but also create more connections with a wider group of viewers. "If I can reach more people and make them feel something, that to me means I have reached my goal as an artist," Salgar says. 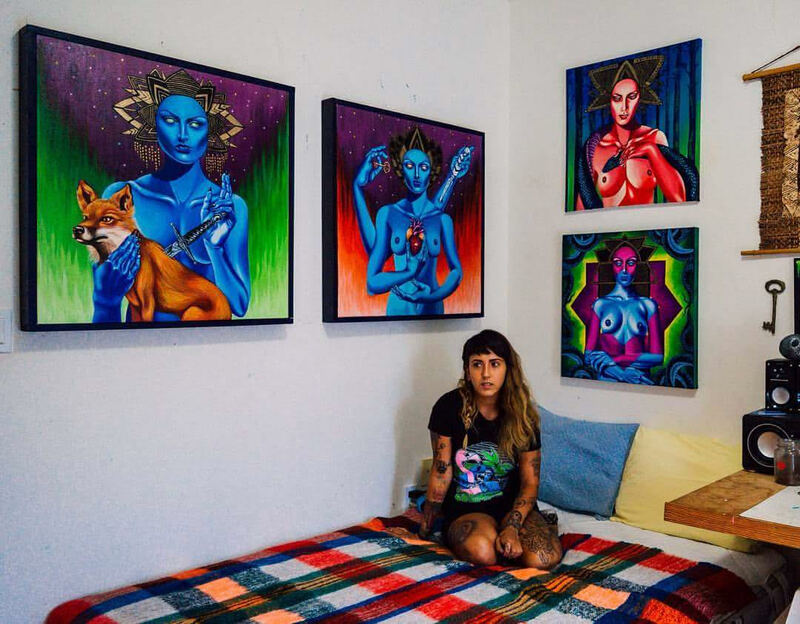 We especially love her murals of mystical women, many of which she shares on her Instagram (where you can also see badass shots of her on a lift painting huge walls). Her figures are gorgeous, even when sometimes they seem a little eerie or mysterious. Salgar shares that some are definitely “influenced by important women in [her] life” but that others come from her imagination. Some pieces she creates with a message in mind, while others she leaves completely open for interpretation. "Although the humans I paint look like they are from another planet or dimension, they are always interacting with the “earthly” creatures I pair them with,"Salgar tells HG. Salgar grew up with a love of comics and horror movies, which totally comes through in her work. A lot of her figures also look like characters from a fairy tale or fantasy movies. 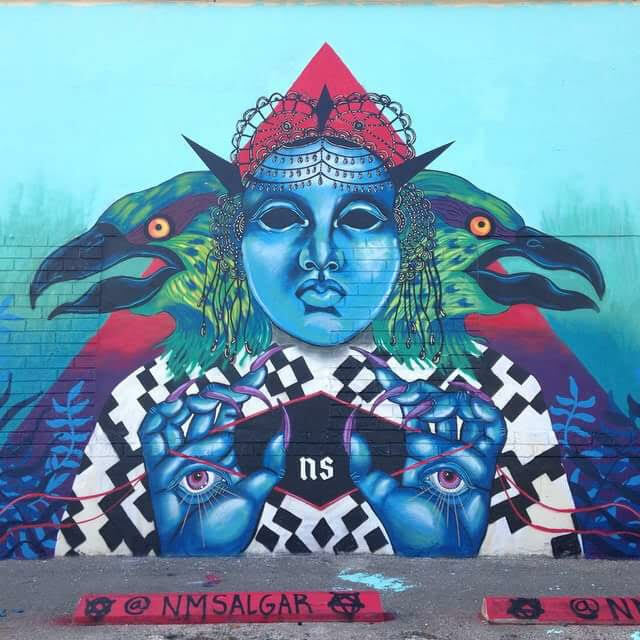 "A lot of my inspiration comes from my environment, music, and the people I surround myself with," Salgar says. "I travel a lot and when I paint a mural in a different country or city I like to research and incorporate things that speak to me about the place." We’re all about getting lost in artistic worlds and even though we can’t see all of Salgar’s work in person, seeing photographs of them is ~super~ inspiring. Salgar will be doing an artist residency in Barcelona at UntitledBCN soon and we can’t wait to see what she does next.